I'm a pancake minimalist. 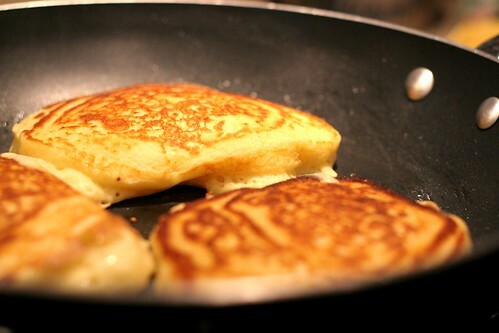 I enjoy banana pancakes every once in awhile, but give me just plain old buttermilk pancakes any day. I love the crispiness and the butter flavor that shines through. Covered in syrup... there is nothing better. Michael and I love getting pancakes from a local diner. He brought me some in bed once, on a weekday. This is complicated when you don't live together. He is the best. I enjoy lazy Sunday mornings... whipping up some buttermilk pancakes, frying them in melted butter and curling up with a plate of hot pancakes. Such a great way to start the morning. I have these moments when I get really excited about Michael and I getting married and finally living together under the same roof. I can't wait for our first married weekend at home together, after our honeymoon. I will probably make these pancakes. 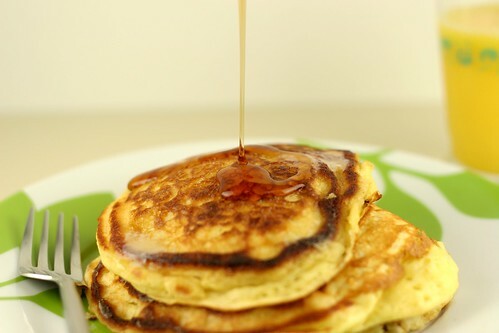 This is my go-to buttermilk pancake recipe. It's so easy I have it memorized. The 1 cup of flour is easy. Then I just remember 2-1-1-1/2 for the baking powder, baking soda, sugar and salt. Maybe I'm weird though. 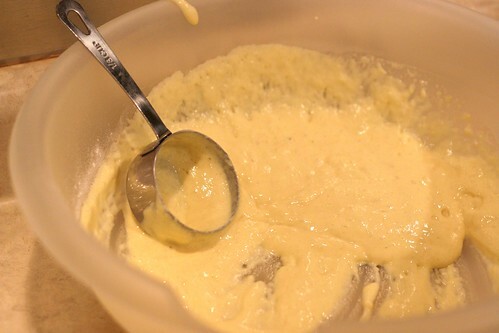 I like to let the batter sit for 5 minutes or so after mixing so it gets thicker. Then I use a 1/4 or 1/3 measuring cup to ladle the batter into a skillet greased with melted butter. I love to watch the little beauties frying and bubbling up in that hot butter. Be still my heart. 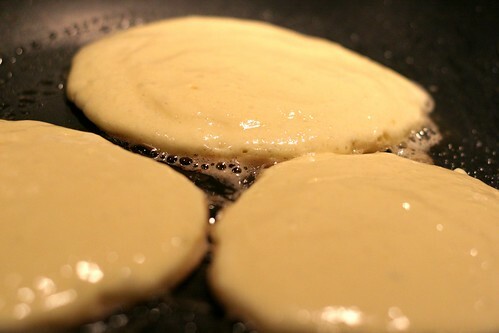 Flip them when there are bubbles on top and they start to rise. See how light and fluffy they are? It doesn't quite have that diner flavor because there isn't a ton of butter in the batter, which is good! This is a little bit of a lighter version. And it's nice because it only makes about 6 medium sized pancakes, which is perfect for 2 people. Say hello to the most perfect breakfast on the planet. The only thing that would make this better is a huge mug of hot chai tea with soy milk. But I could easily make that happen so I'm not worried about it. 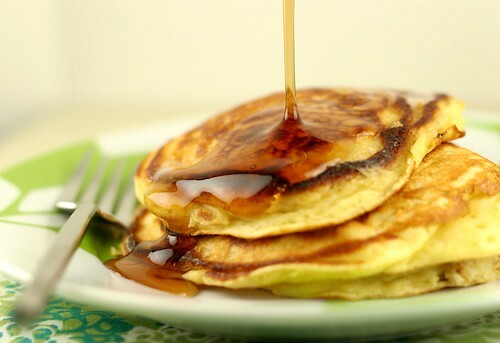 Are you tired of pictures of pancakes yet? Me either. Are you hungry yet? Me too. Whisk together first 5 ingredients in a large bowl. 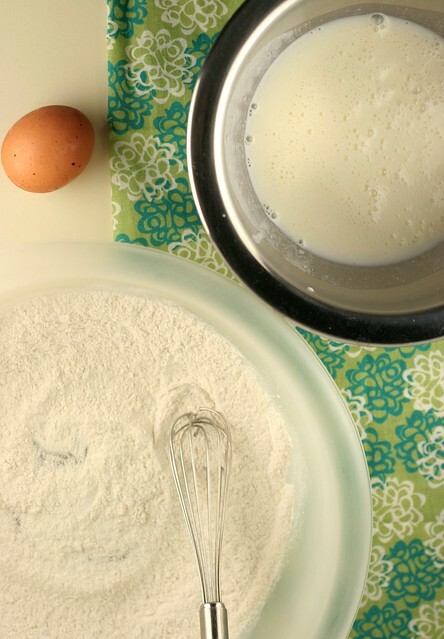 Combine buttermilk, milk, egg and butter in a separate bowl; add to flour mixture, and whisk until just blended. Let stand for 5 minutes. 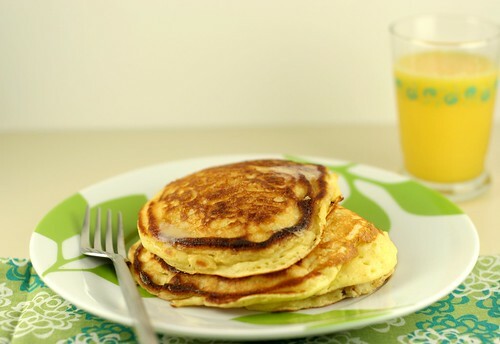 Pour 1/4 cup of batter onto a hot, lightly greased griddle or nonstick pan. Cook until pancakes are covered in bubbles and edges start to become golden. Flip and cook other side for 2 minutes or until golden. I love that you have this recipe memorized. Looking at the pictures, I can see why you do, though. They look perfect. Michael's a lucky man to marry you AND get those in the bargain. what a lovely start to a lazy sunday :)I love the smell of pancakes in the morning. It's even better when you get to be the one to wake up to that smell. Michael will surely be enjoying that in the future!